1 Password: the password manager that’s as beautiful and simple as it is secure. Just add your passwords and let 1 Password do the rest. Sign in to websites and apps with just a few taps, and use the password generator to change your passwords and make them stronger. Featured on NBC’s Today Show: Coolest must-have phone apps of 2017! Try 1 Password free for 30 days, then keep going with a 1 Password subscription. Everything you store in 1 Password is protected by a Master Password that only you know. 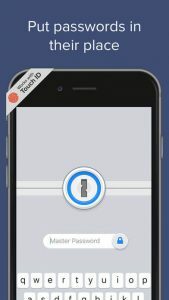 1 Password uses end-to-end encryption, so your data is only ever decrypted offline. The encryption keys never leave your device, and you are the only one who can see your passwords. We love 1Password and strive to make it the best it can be. Connect with us with us at support@agilebits.com, @1Password on Twitter, and Facebook.com/1Password! 1Password.com is a monthly service that costs $3.99 for individuals or $6.99 for a family of 5 (prices vary by region). Payment will be charged to iTunes Account at confirmation of purchase and auto-renews at the same price unless disabled in iTunes Account Settings at least 24 hours before the end of the current period. Your subscription can be managed in your iTunes Account Settings. No cancellation of the current subscription is allowed during the active subscription period.